Summary (from Goodreads): It’s time to choose sides… On the surface, Sorry-in-the-Vale is a sleepy English town. But Kami Glass knows the truth. Sorry-in-the-Vale is full of magic. In the old days, the Lynburn family ruled with fear, terrifying the people into submission in order to kill for blood and power. Now the Lynburns are back, and Rob Lynburn is gathering sorcerers so that the town can return to the old ways. My Summary: After surviving an ordeal and nearly getting themselves killed, Kami and her little band of misfits know they have only one job to do: gather support against Rob Lynburn and protect their sleepy little town. But the winning side may not be theirs -- even with all the sorcerers in town. Rob's numbers keep growing exponentially, while Kami and her friends are hard-pressed to find a single new supporter. Can they stand against Rob when he demands a blood sacrifice, or is Sorry-in-the-Vale doomed to return to the old ways? My Thoughts: I have adored Sarah Rees Brennan's writing since first picking up the first book in the series (Unspoken) last year. The idea of a sleepy little town with some serious secret-keeping issues hooked me right away, and I have yet to find a person who didn't enjoy the first book just as much as I did. Unspoken was one of those books that I finished in the middle of the night, unable to put it down without finding out what happened. It was also one of those books that you flip over after you're done reading and start again.... I know I've re-read it more than a few times! 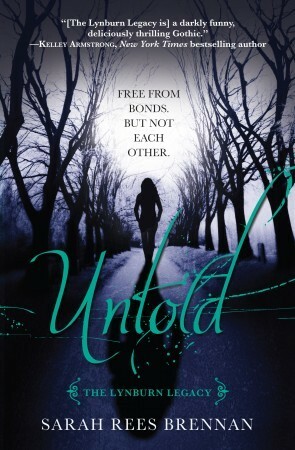 Untold picks up right where the first installment leaves off. Amid all the chaos of a town at war with itself, the author manages to incorporate realistic emotion and hilarious dialogue between the characters. It's a great contrast to the dreariness of Sorry-in-the-Vale, and I found myself torn between laughing and stressing about what was going to happen next. I won't say anything for fear of spoiling it for all of you who have yet to read Untold or Unspoken, but there were a few events that transpired in Untold that made me very, very happy. As usual, the characters were incredibly well-developed, and the story didn't center on the romance element. The only thing I wish was different is the cover. I absolutely ADORED the cover for Unspoken, and I'm a little disappointed in the cover art for this installment. The cover of the first book really brought together all the gothic elements and made the book stand out, while this cover didn't really do it for me. Final Thoughts: If you're a fan of fantasy, romance, and paranormal YA, then you absolutely positively NEED to check out the books in Sarah Rees Brennan's Lynburn Legacy series. Ooo a new one for me to check out. I was actually drawn in by the cover! I'll have to go look up the one for book one now. Glad you enjoyed it. I just love finding ones where you can't put them down and want to re-read em right away. Thanks so much for the heads up!! Wow, I'm going to add thus to my TNR list right now. I actually love this cover for all its creepiness. Great review. You've convinced me to check it out.